Anyone know what actually caused this dryer fire at humboldt? Also what were they drying? Any others one should be looking out for? Not sure how I get so much chaff in the drying chamber, yet nothing much comes out of the exhaust ports. Would be nice if there was a fire detection unit that could be installed, as running all night a guy can't watch it 24/7. Last edited by hihi962; 03-17-2019 at 04:32 PM. Gas leaks, lots of valves and fittings that can potentially leak and ignite. Fan bearings that go and fan blows red hot molten metal into the plenum. When was that fire? That would be a sick feeling. 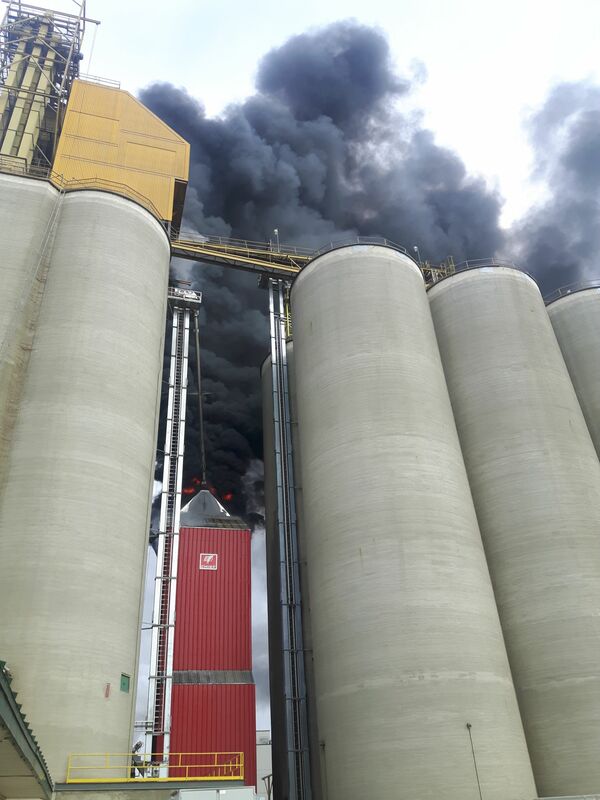 Quite sure that pic is of the fire at NorthWest Terminal in Unity, Sask. Heard they were drying canola at the time. Also was just commissioned a few months before as it was the replacement dryer. The previous dryer was also lost to fire. ?????? Yes it was in unity. And speaking from experience, dryer fires start from the flow of grain being blocked and the grain gets too hot or an accumulation of screenings which then get too hot and catch on fire. What happened to me was one year I was drying super wet canola and a clump stuck in the drier somewhere. Didnt notice it and didnt clean it out and fired up the drier again months later and it clump started to smolder. Luckily i was there and smelled the smoke so emptied the drier and caught the clumps. Was doing high moisture grass seed so it ended up being a cheap learning experience. Not sure what happened on that one, but on the old vertec dryers, the heat ducts are about 6" from the end wall of the tier so when drying relatively high trash canola, trash can accumulate on the fill side of the dryer and bridge. This stops the flow, and eventually starts to smoulder. If you are watching the dryer it pours out a lot of smoke in short order... In wet canola I run it down 2 tiers before dark every day. From the dryer fires I've worked plugged meter rolls on older units, newer ones usually have a grain temp and plenum temp sensor to shut down but can fail. Gas leak/ruptured gas hose, self explanatory. Other mechanical failure, hot motor, electrical short, etc. The hardest one to determine was an improper bolt/sprocket assembly on an idler for the unload auger. Heat transfer from friction was enough to start a fire in the grain column and get it going. Keep them clean, keep the maintained, watch electric connections and gas lines and "should" be OK. Doesn't really surprise a guy though they sit out all year and are supposed to run 24/7 when its go time. Don't blame the baker when the butcher bakes the bread. Headline said humboldt, but I guess msm don't care if the photo matches the article..
One thing I thought of, was to have a small thin plastic airline run all around the dryer, apply pressure to it, connect it to a pressure switch or sensor, as soon as the line melts anywhere, pressure gone, alarm rings. But just having it on the exterior would mean the fire would already be out of control by the time its detected, I need to think of something that can react faster..
Last edited by hihi962; 03-17-2019 at 11:10 PM. Both our dryers have air plenum temp sensors and interlocks to the heat, but by then it’s usually too late. I don't imagine smoke detectors ( or maybe there is some sort of industrial environment smoke detector ) would like the environment around a grain dryer due to the steam/vapor or the chaff for that matter but certainly the stink is there when the smoldering starts happening. Also thought of ( and very costly ) is thermal image camera's aimed at both sides of the dryer that had the ability to be set to react once a certain max temperature is reached and in either case would trigger a gas and electric fan drive shutdown along with an alarm sent to whoever is operating the dryer.